Hi guys! As I mentioned, Friday was my birthday! 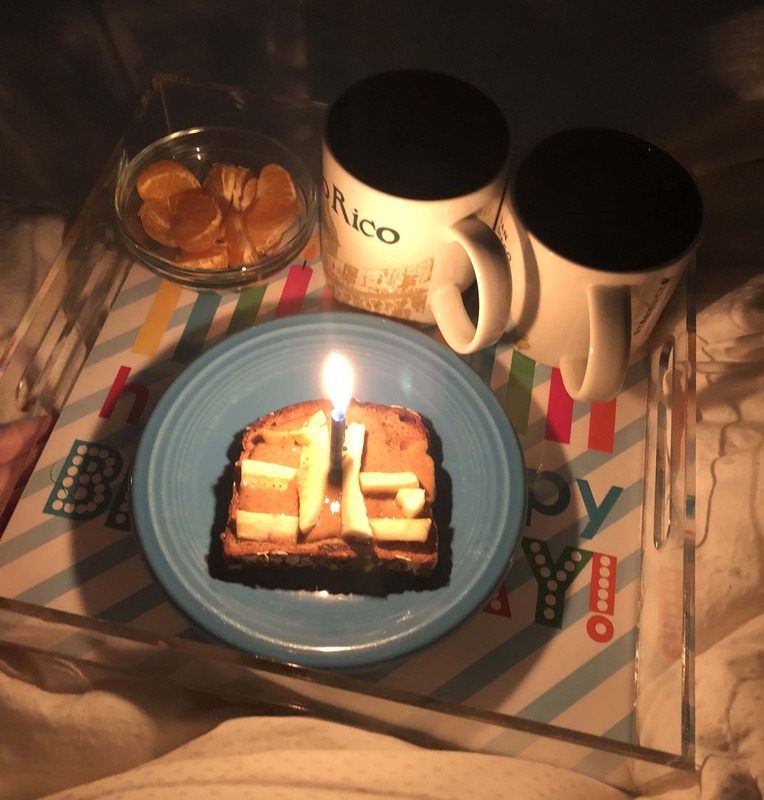 It started with breakfast in bed. :) Matt and I do this every year for each other – fun tradition! The tray was a wedding gift I think and has all sorts of different paper inserts for various holidays. Matt took the day off work for my birthday; it was such a nice treat to get to spend my birthday with my two favorites! 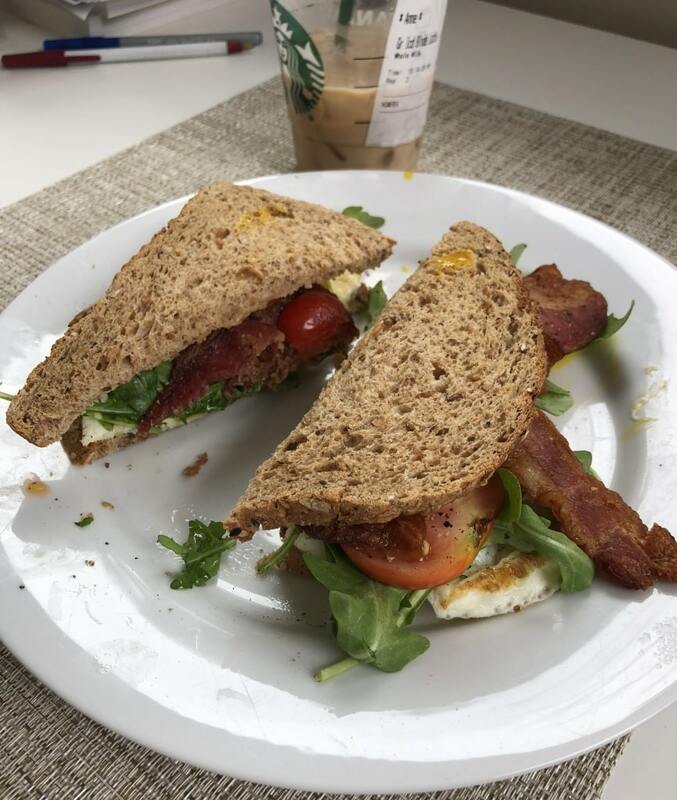 After some morning playtime with the little one, I went off to a yoga class and brought back coffee for both of us; Matt whipped up some egg BLTs for us for an early lunch. Our plan for the day was a hike! It was rainy in the morning but luckily by noon it had cleared – cloudy and cool, perfect for hiking! It felt sooo nice to not be drowning in sweat. 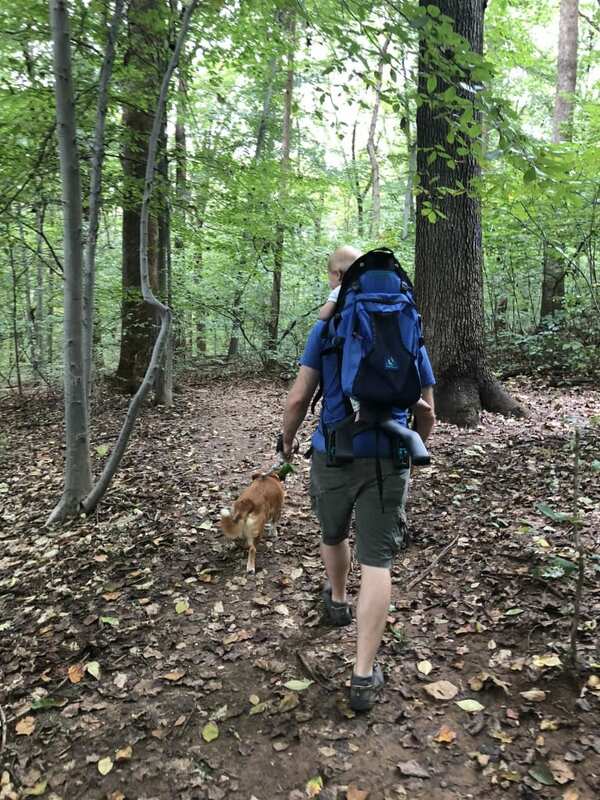 We had the trail more or less to ourselves and Riese enjoyed the fresh air as much as we did (and Freyja had basically the best time ever, too). 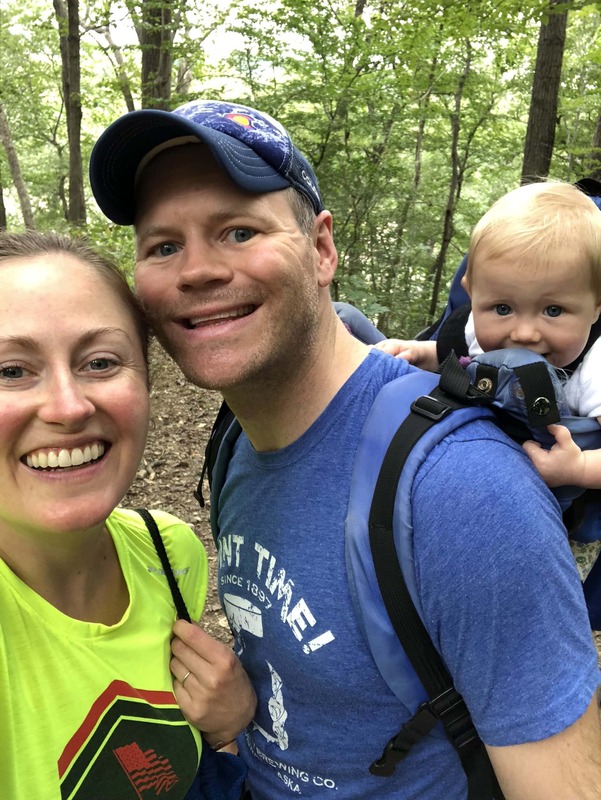 We can’t wait to do more family hikes now that the weather is (finally) cooling down! The woods are so peaceful and calming – I love being among the trees. We spent some time playing with Riese at home and resting up in the late afternoon, and then around 5 we headed over to our friends Heather and Mike’s place! They had invited us over for an early dinner + baby play date (their little one is a couple months younger than Riese – crazy how at first that was a big difference and now it seems like they are essentially the same age already) not knowing it was my birthday; I told them that it was my bday but that we were happy to hang out and had no plans – I just didn’t want there to be any pressure for them to do a big birthday thing or anything! 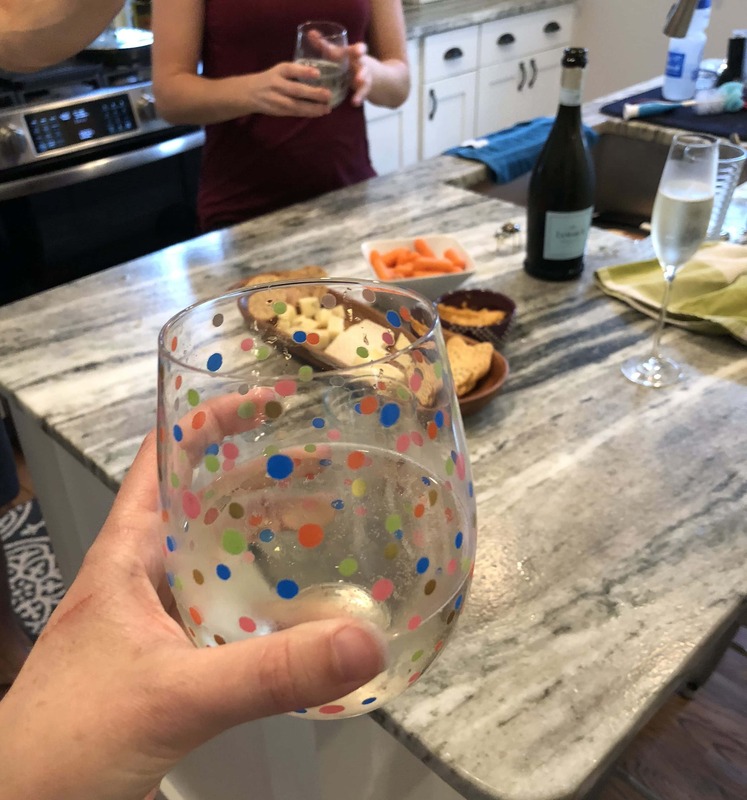 When we arrived, we got straight down to business: bubbly + snacks! Meanwhile, the little ones played! 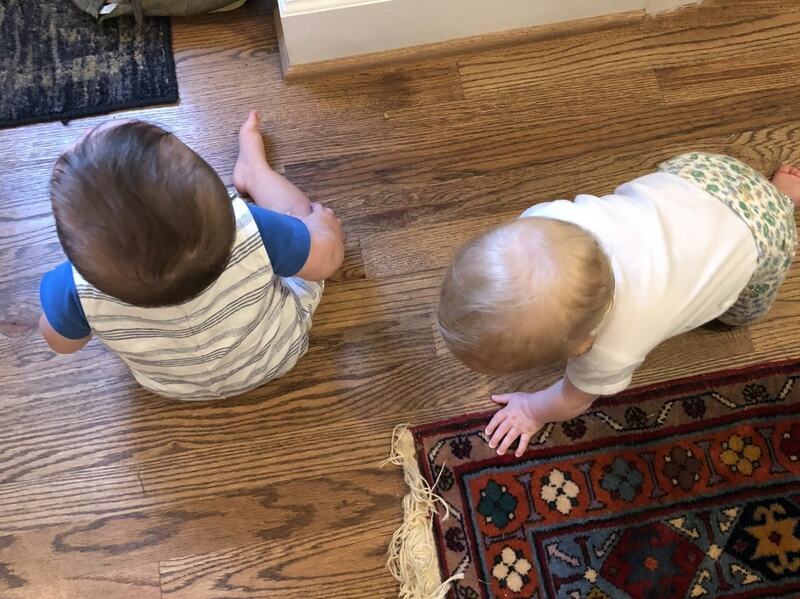 SO cute to see them interacting – they were crawling all over the places together and it was so sweet. 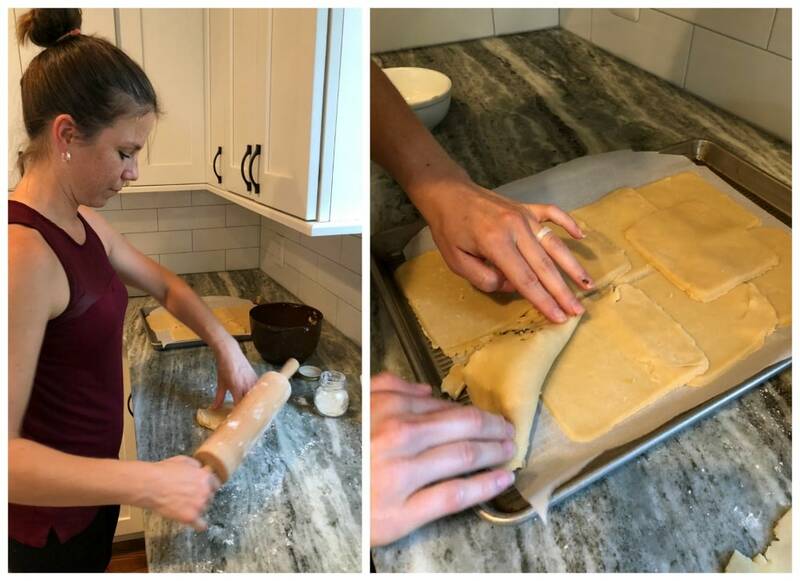 As for dinner, Heather was making salmon empanadas – how creative! I never would think to make homemade empanadas, but now I want to try it! The filling was especially creative. She did a mix of salmon (pan seared in some oil with a little salt and pepper, then flaked and mixed with a can of green chilies) + brussels sprouts leaves (chopped up really small and sauteed in a little oil with salt and pepper). It was a really good combination! 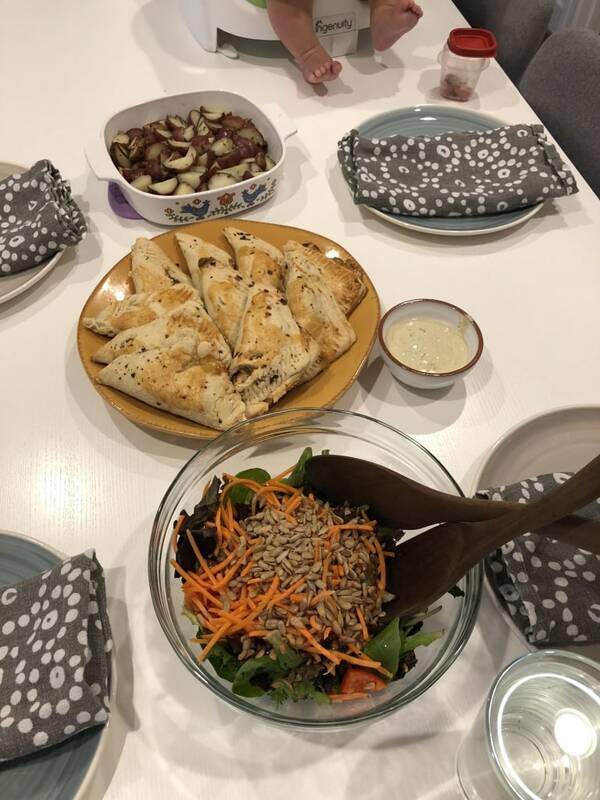 Riese enjoyed the salmon (before it was mixed with the chilies) – she LOVES salmon. As for dessert, we enjoyed a fruit tart! Heather was really sweet and apparently looked back at old blog posts to see what I usually had for dessert on my birthday to make sure she got something I liked. :) I went to the bathroom and when I came back out they had snuck out the tart with some candles! 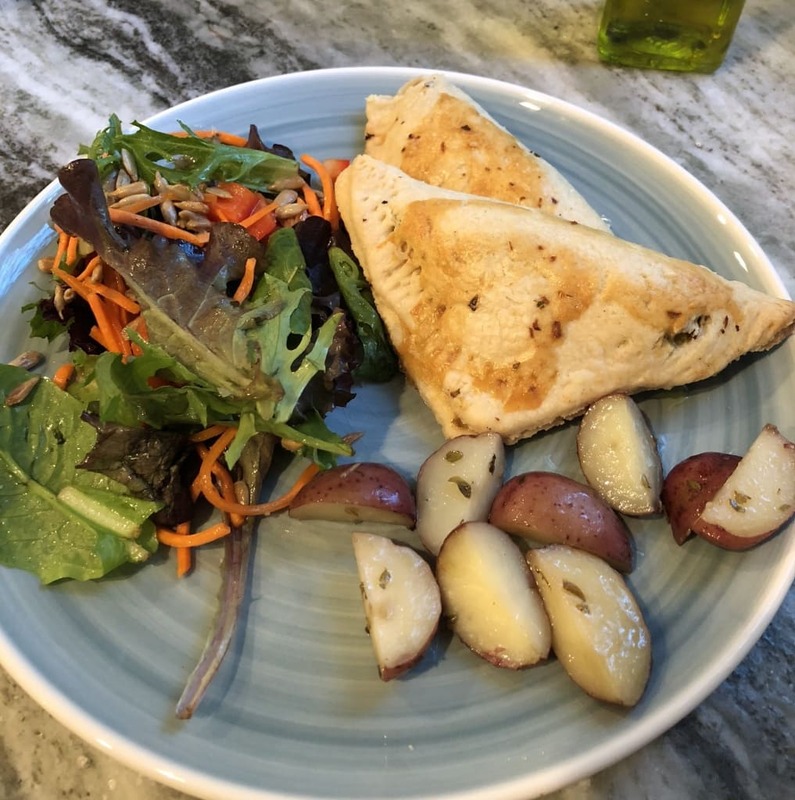 I’ll be back tomorrow to recap the rest of the weekend’s food + fitness fun – have a great day! 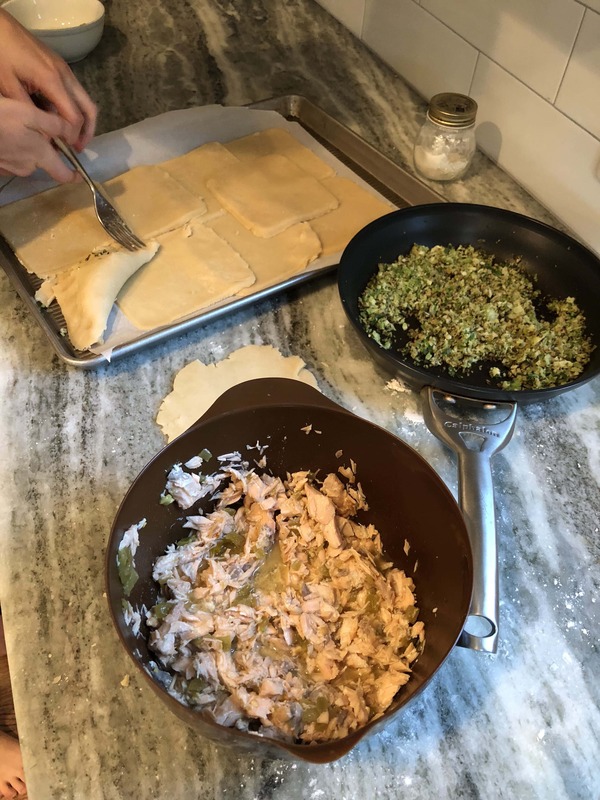 Blogs are so handy that way ;) Maybe salmon empanadas are a theme now, too. It’s on the internets! Official! Happy Birthday! What thoughtful friends & hubby you have! Reise is just adorable. She looks like a baby doll in some pictures! I’m curioys to k ow what you order from Starbucks- what is a healthy option for someone with dairy intolerance? Never sure if soy, almond or coconut is healthiest? Thank you! I usually get a whole milk latte from Starbucks — if you have a dairy allergy, I would just go for whichever dairy alternative you think tastes best! They all have different nutritional benefits. :) Soy has the most protein, though, if you’re going for that! 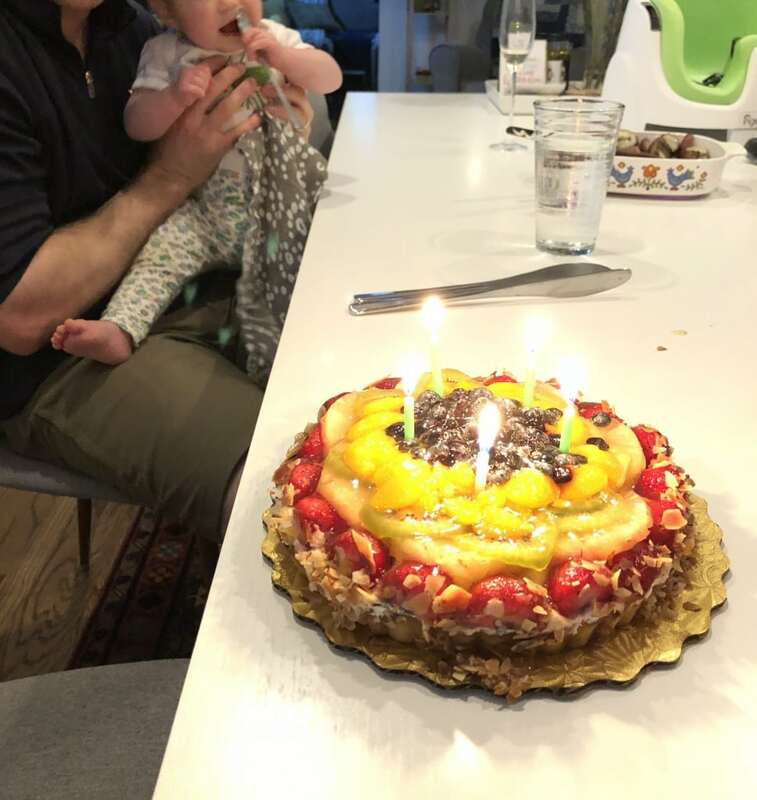 What an amazing birthday celebration! I have never made an empanda before either, but those look divine. Happy belated, and I wish you all the best in this coming year! Looks like a perfect birthday party. Very nicely done. And love the picture of the three of you, w/Riese smiling from her rucksack! HAPPY BELATED BIRTHDAY ANNE. Looks like it was wonderful. Happy birthday!! That fruit tart looks amazing!